We have a love/hate relationship with flip-flops this year. Flip flops are easy, comfy, super cheap, washable, and easy for the little ones to put on themselves. However, my 4 year old girl just outgrew the toddler flip-flops with the added stretchy strap around the back. (At least at Old Navy she has.) So we had to buy her regular flip-flops, figuring if the stores say she’s old enough to keep them on her feet……..then she must be old enough to keep them on her feet. Who am I kidding?? She’s only 4. Well maybe age has nothing to do with it and she’s just not as skilled as the Old Navy designers think she should be. That girl flips those things off constantly, trips on them as they shift, and is constantly hopping on one foot as we’re trying to walk somewhere because one of her flip-flops is several feet behind us. My favorite thing, is when this happens at the store……..and people are waiting for my hoppy little chicky to get out of the way as she struggles to retrieve her other flip-flop that is now underneath someone’s cart. The strapless-back-flip-flops for kids…………hate them. So instead of throwing those frustrating $2 flip-flops in the garbage, I’ve decided to make them work for us. And made these. Because options are always fun, right? The straps are stretchy, so they fit snugly around the back of the foot…….also making them easy for your little one to take on/off all by themself. And you know, I’m kinda crazy about that pop of color around the back. So, the frustration turned into a happy surprise of a solution. You can leave the straps plain (especially for the boys)…..or attach a simple little bow right to the back, for a girl. It may cause excessive smiling while looking at it. But I’m okay with that. No more hop, hop, hopping around looking for the stray flip-flop. They stay on perfectly while she runs, skips and twirls around. 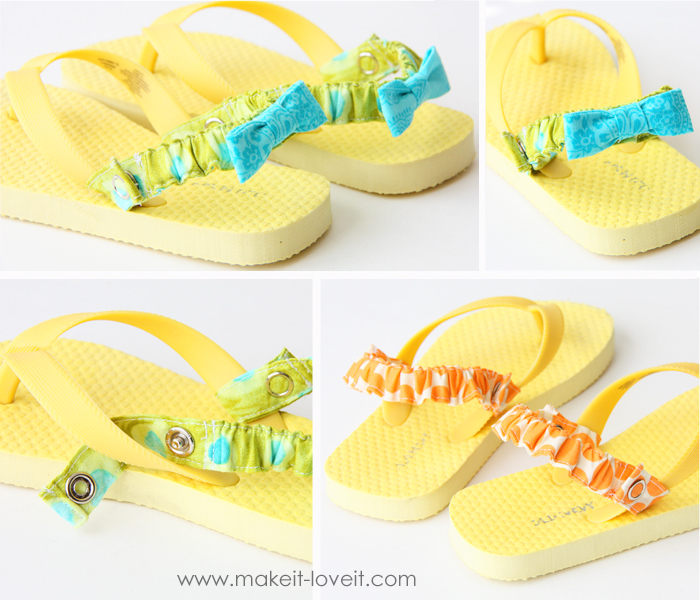 Would you like to make your own back straps for your flips-flops? Since you may be making a different size, I’ll show you how I made mine for my little girl…..and then you can make the adjustments you need. I purchased these flip-flops at Old Navy…..there’s always a lot of colors and sizes to choose from. These yellow ones are a size 10/11 (toddler size) but found in the little girl section…..not the baby section. First, you’ll need to decide how long to make your strip of fabric. So you’ll need to measure around the back of the flip-flop. You’ll need enough fabric to wrap each end of the strap around each flip-flop strap and then be snapped shut…….plus a little extra to all the fabric to shrink a bit with the elastic and look a little bunched (I added about 2 inches for this.) You’ll also need a little extra at each end to fold under and sewn shut…….finishing off each end. Then decide how wide you want your strap then double that and add your seam allowance. I wanted my straps to be 3/4 inch wide so I cut my strips 2 inches wide (that includes the 1/4 inch seam allowance) and then calculated out that 13 inches would work great for the length. So, I folded each strip in half lengthwise, with right sides together, and sewed them together with a 1/4 inch seam allowance. Then I turned each strip right side out (need help with that? click here) and ironed each strip flat. (The seam is along one edge, not down the back or front.) Then I sewed a seam down each edge of both strips……nice and close to the edge. Neck, I cut a piece of 1/2 inch wide elastic that was about 10 inches long. (I cut more than I knew I needed, because I wasn’t sure exactly how much I would need. More is always better at this point.) Then I started threading it through one of my strips. I threaded it all the way through, slowing down as I was pulling the elastic all the way through. Then, I pulled the elastic through a little bit more, really slowly, and only let the end of the elastic slide inside about an inch and a half from the end. You can see one end of the elastic on the left……the other end is right where that arrow is. Then I let the elastic sit there in place as I folded over that end about an 1/8 of an inch, then another 1/8 of an inch…..then sewed it in place. Then I wrapped this end around the flip-flop strap and decided where the snaps would go. I knew I didn’t want the elastic in the part of the strap where the snaps were being attached (because it makes it too thick for the snaps and more bulky around the plastic flip-flop strap), so I made a mark where the snaps would go (the red arrows) and then decided that the elastic couldn’t go beyond where the black arrow is. So I pulled the elastic from the left end really slowly, until the right end of the elastic was about even with that black arrow. Then I made 2 seams right to the left of where the black arrow is, to be sure and catch the elastic and sew it in place. Then, I pulled the elastic from the left side a bit more, bunching up the strap a bit………and giving it a nice stretch as it’s being pulled. You can measure on your child’s foot to make sure that the elastic isn’t too tight or too loose and looks just right. OR, if you’re making this for someone you can’t measure on, you can hold it up to the flip flop and be sure that it looks right. You’ll want the strap to not go all the way to the heel as it’s resting there in place, because you want it to stretch and fit snugly when it’s on the child’s foot. Then you want to leave just as much fabric on this end of the strap as you did the other end, and make 2 more seams to secure the elastic in place. It may help to fold it in half and let the unfinished end go a little longer because it still needs to be folded and sewn (between the brackets below) and mark where you would need to make your two seams by comparing it to the finished end. Now, you have this extra elastic to deal with. Pull it and slide the fabric down as far as it will go. Then cut the elastic as far down as you can, so there isn’t a ton of elastic left inside……because you don’t want the elastic in the way when you’re attaching the snaps. Then flatten that fabric back out, turn under the ends and sew it just like the other end. Now, you can either stop here and be done (hallelujah!!) or you can create a little bow. All I did for the bow was cut a strip of fabric that was 2 inches wide by 4.5 inches long. I sewed it into a tube with a 1/4 inch seam allowance, turned it right side out and ironed it flat. Then I folded the ends over, overlapping them by a 1/2 inch, then sewed them in place right down the center. Then I cut another little strip of fabric that was 3/4 inch wide by about 2 inches. I folded each side edge in towards the center and pressed it flat. Then I pinched the center of the bow (to create a smaller bow center) and then wrapped the narrow strip around the front and back to the back of the bow. I pulled the strip tightly as I wrapped and then tucked under the second end (trimming off extra fabric if necessary) and then hand sewed it into place in the back. Then I hand-stitched the bow right to the center of the strap. Then I attached the straps to the flip-flops. And then made more (without the bows). You know, for that added color option. No more tripping, hopping, or scrambling to retrieve a stray flip-flop. We are back to a love/love relationship with these little sandals. Whew. These are darling!! Great idea! You inspire me to want to do these things. I made my daughter's Halloween costume this year, and though my husband thought it was amazing I could go from my brain to something creative without much effort, my sewing was shoddy at best and there were holes and bad stitches and… well, it was completely serviceable as a Halloween costume, but your projects put me to shame shame shame. Maybe some day I'll stop looking at this site and drooling and actually TRY something. love this idea! thanks for the tutorial! These are the cutest ever! I love little kid feet and this just makes them that much cuter! Great idea! Love these! My son has outgrown the size that comes with these on the back but he still cant quite keep his shoes on! Great idea! How are cute are these??!??!?! Great idea! you are a genius. I want to make them for myself!!! Genius! Your timing is perfect-I need these desperately- but for my son. Could I do the snaps directly on the elastic (I would use colored elastic). teehee so cute! It's not bothersome for her? I always fear blisters in the summer! Yes, they stay on great! And yes, you could put the snaps right on the elastic and skip the fabric. Nice and simple solution. Seriously, your head must explode with great ideas ALL of the time! I don't have any little girls to make these for but I definately would make them if I did…fabulous! These are so great! Thank you for the great tutorial:) Adding this to my ever growing "list". Now those are flip-flops that could be worn to the White House. my son is 5 and he has the exact same problem and its so frustrating that you can'tfind them with straps for slightyly older kids. I've had plans to add black elastic around the back of his and you've inspired me to actually do it. very cute girly straps!! Is it bad that I want to dress up my OWN flip-flops with these?? :) LOVE! I'm sorry, but you are simply amazing! I absolutely love the projects you come up with, and I want to make each and every one (and have already made some!). We went through the same problem with flip flops, but my kids finally managed to get used to them. They might be getting these little lovelies added anyway! At least the girls… :-) Thanks for another great tute! PS: I LOVE reading about and seeing pics of your adorable babes! this in ingenious! I might have to try it! Thanks for the great ideas! I've been wanting to make some sort of strap for the back of my son's flip flops for awhile but haven't quite gotten around to it (spring is refusing to arrive in Utah and flip flops don't work well in the snow!) As always, your version is much more adorable and exciting than what I had in mind. I don't know what I'd do without your ideas! Lol. Thanks! This is about the cutest thing I've ever seen. How clever. I was just thinking I hope I can find flip flops with straps so they stay on my 3 and 4 year olds feet. This is a brilliant idea! Your a sewing, crafting goddess!!!! Since I'm a wimp about snaps, I'd probably just sew mine right on and skip the interchangeable part. Great idea though! So sweet! I love the idea! I'm going to try this for my boys! I don't have girls to make them all sweet and girly… but I suppose I could make little fabric cars to add to the straps… oh yeah I think I'll do that! Love these!!! So cute & interchangeable…..couldn't get any better!! You are so crafty!! And I think I'll make some for my flip flops too! I can’t resist flip-flops but sometimes they give me blisters. I’m going to try this. You think of everything, Ashley! Holy cow…this is AWESOME!!! I have GOT to make these. How do you keep coming up with this stuff!?! GENIUS! I love these! So smart and creative! Thanks! So brilliant and so cute! Thanks for the great idea and tutorial! I guess this falls under the necessity is the mother of invention. Brilliant. I love how cute they look and so practical too. THANK YOU SOOO MUCH! My sweet girl is still in toddler sizes, but I imagine this time next year she'll be in the "big kid" flip flops (she's 3 now). PERFECT solution! Can't wait to try it out! Super cute! Unfortunately my 4.5 yr old would die if she had ton wear straps on her flip flops. She would much rather lose them and hop around! My 2 yr old son however, hates the rubber strap. I think I'm going to cut it off and make these instead! Oh my gosh! You so totally rock! ;) My 3 year old (4 in August) also outgrew the flipflops with the backstrap… This is great and I'll be trying my hand at them as well. Thanks! I love these! I was just thinking I should make some for my daughter's new funky black and white polka dot flip flops but I didn't think to include a bow. So cute! What a great idea!! I think even the older kids would be happy to have these on their flip flops. umm..GENIUS! so adorable! you think that maybe you could use velcro too? I'm not too familiar how to attach snaps. These are so adorable! And they give some real pop to those plain old flip-flops:) BRILLIANT! You never disappoint. Thanks for the great idea. I know my daughter will just love these!! Did you make these last year. I think I remember seeing a tut on this before. Great Idea! Gonna have to make me some. These are great. My 3 year old and 2 year old twins got some cute backless flipflops for their birthdays. Now I know how to keep them on! Super cute. I love them! you are a freakin' genius and i will never, ever be as cool as you. seriously. how do you come up with this stuff??? Thank you so much! MY 4 year old has been wanting flip-flops and I was bummed to see they don't make backstraps in her size either. So this is great! THANK YOU! I used to live where it was hot all the time and one could not find the flip flops with straps. So, I just sewed some plain white elastice to the back, without the snaps for my son! I really wish I'd have had this idea! NOW, my daughter's gonna get it!!! These are wonderful! Make me wish I had a little daughter to make them for right now. I am a fledgling blogger and would like to show them on my blog. Can you tell me how to link or whatever to do this? This is worth the comment to say I LOVE THIS IDEA!!!!! you are brilliant. sometimes i want to hug you through your blog. Aha! I was just thinking about these a couple of weeks ago. I just didn't quite know how to go about doing it. I love the interchangeable aspect. So, now that you have a tutorial I need to make some of these for my daughter. Awesome! This is such a PERFECT idea!! You are AMAZING!! THANK YOU for sharing!! Ingenious! I have a 4.5 yr old and she can't keep her flip flops on for nothing. This would help her tremendously! Your story made me laugh. I have 7 year old twins and they still trip and fall out of their backless flip flops. I remember being in the mall and got so frustrated that I bought a cheap pair of runners and tossed the flip flops in the trash. I can't wait for my snaps to arrive so I can get started on some of these straps. Thanks for the tutorial your brilliant!!! This is probably one of the best "why didn't I think of that" ideas I have seen in a while. Awesome!!! What a great idea! I'd make some cute straps for my daughter to change up her flops, except she prefers them without straps and has worn regular Old Navy or Target flip flops since she turned 2. Last year I had to cut the straps off because she preferred them that way and her feet were so small! Kids are hilarious. Thank you Thank you Thank you! My 4 year old daughter has always worn strapless flip flops with NO problem since she was 18 months old. However, my 3 year old son is now in the same boat as your daughter! We will be making some straps ASAP! I love it when you solve a problem for me! Our kids are so clost in age (minus the infant for me), so much of what you do fits our family too! Thank you! I've tried a couple of different methods for turning regular flip flops into kid friendly flip flops without much success…then I saw this and thought well duh! Absolutely brilliant and totally cute! What a fantastic idea! Great tutorial as well. Thank you so much. I'm sure these will come in very handy for my Granddaughters' flip flops this summer. This is probably one of the smartest ideas I have seen. My 4 year old has the same problem. I will definitely use this idea. BTW-the children's place has flip flops with the strap in the back up to size 10-11. Don't know what size your daughter wears but mine is a 10. So cute and SO smart! Love them- I'll be linking to this post for sure! You always amaze me with your ingenuity. I never would have thought to make those straps. What a great idea and it really dresses up the flip flops. Fantastic idea! Thanks for sharing. Perfect for little feet…those flipper floppers are hard to walk in! These are so cute! Can't wait to make a pair… I linked your project to my Saturday Stumbles post! These are so stinkin' cute! I REALLY need to get a new sewing machine. Just brilliant! Such a great idea. Thanks for sharing. What a great tutorial, thank you! I was thinking I would use the same thing for my daughter's flip-flops and make one to cinch up the back of her pants (since she always has plumber's crack going on). Love. I do not sew so where can i purchase these! I thought the same thing Isabel… There are some on etsy but not nearly as cute. I would totally buy them! Looking forward to the next Silhouette promo! Thanks again! Brilliant. You should patent and market them–truly! wow very creative.. so much effort for flip flops ..but it sure adds to beauty and value..awesome..KUDOS MOM !! I love this (and all your other ideas)! So after you measure the flip flop, how much did you add to that number? I'm trying to figure out total inches of fabric for my little one and i've measured around the back of the shoe but I'm not sure how much to add to that–3 inches? 4? Thank you! Great idea. We have a hard time keeping flip flops on around here too. Thanks so much for this solution! I think I need some for me, too! LOVE this so much, I posted a link on FB!